Texans have always tended to think big. In 1912, a San Antonio group began raising money to build a monument to the defenders of the Alamo. 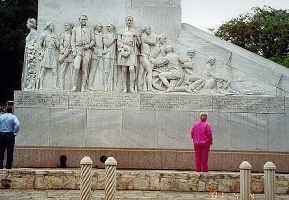 But the memorial they wanted for Alamo Plaza would not be any run of the mill monument. It would be Texas-sized and then some, an architectural wonder. The Alamo Heroes Monument Association had an architectural drawing prepared to use in the fund-raising process. Whether the association�s architect ever got as far as preparing detailed plans is a bit hazy after all these years, but his rendering survived. As envisioned, the base of the monument would feature 30-foot statues of four Alamo heroes: The Big Three (William B. Travis, James Bowie and David Crockett) and William Bonham. The monument also would have a museum with displays from each of Texas� counties. A giant white stone obelisk would tower above the museum, topped with what looks to a modern eye like a gilded Hershey�s kiss. Beneath the �kiss� was an observation area slightly reminiscent of the University of Texas tower in Austin but with a touch of the orient thrown in. In other words, while the planned monument could be called distinctive, some would say the distinction lay in its ugliness. The monument�s aesthetic qualities might be called into question, but its scale would command attention. The association wanted the monument to stand 802 feet tall. Indeed, according to a Web site called emporis.com, the Alamo monument would have been the tallest structure in the United States in 1912 � rising eight feet higher than the Woolworth Building in New York City. Not only would the monument have been the tallest manmade object in the nation, it would have been the second highest in the world. Only Paris� Eiffel Tower, built in 1889, would have exceeded it in height. The Alamo monument also would have reigned as the tallest edifice in the U.S. for another 18 years. Not until 1930 did the building at 40 Wall Street in New York top 800 feet. In Texas, the Alamo monument would have been the tallest structure until 1982, when the 75-story JPMorganChase Tower opened in Houston. Even today, the monument would have been the tallest in the world. As it is, Texans have had to settle for the 1936-1939 San Jacinto Monument, which rises 570 above the ground where Sam Houston routed Santa Anna�s army on April 21, 1836. The Alamo monument would have cost an estimated $2 million to build in 1912. Unfortunately, the association did not succeed in putting together enough money to get the project off the ground. In 1939, a monument to the Alamo finally rose across from the old mission, but impressive as it is, it�s puny in comparison with the 1912 plans. Designed by Pompeo Coppini, an Italian sculptor transplanted to Texas, the Alamo Cenotaph stands a mere 60 feet above the pavement. The surviving rendering of the monument proposed in 1912 could not be called particularly attractive, but it would have given San Antonio � and Texas � a tourist attraction rivaling the Alamo itself. Come to think of it, maybe that�s why the association had trouble raising the money. An 802-foot monument would have overshadowed the old mission literally and figuratively. Of course, San Antonio still ended up with a needle-like structure on its skyline: The 750-foot Tower of the Americas. Built for HemisFair in 1968, the tower is nearly as tall as the proposed 1912 monument. It�s 130 feet taller than the San Jacinto Monument, 87 feet higher than the Seattle Space Needle and 67 feet higher than the Washington Monument. Alas, to put it in poker terms, developers in Las Vegas decided to �buy the pot� in the tall tower game. The Stratosphere Tower, completed in 1996, climbs 1,149 feet above the Nevada desert. It now is the tallest structure west of the Mississippi. The world continues to remember the Alamo and roll the dice in Las Vegas, but the Alamo monument that never would be has been forgotten.